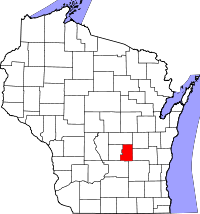 Green Lake County is a county in the U.S. state of Wisconsin. As of 2000, 19,105 people lived there. Its county seat is Green Lake. The county has a total area of 380 square miles (984.2 km2). Of this, 354 square miles (916.9 km2) is land and 26 square miles (67.3 km2) (6.87%) is water. This page was last changed on 15 June 2018, at 11:45.